A middleweight title fight between Michael Bisping and Georges St-Pierre served as the main event of last night’s UFC 217 pay-per-view event in New York. Former UFC welterweight kingpin Georges St-Pierre is looking massive in preparation for his UFC 217 title fight with current middleweight champion Michael Bisping. The Canadian superstar, “GSP, recently took to Twitter where he shared the following picture showing off his size as a middleweight. St-Pierre will square off with Bisping for the UFC’s middleweight title in the main event of UFC 217. UFC 217 takes place November 4 live from Madison Square Garden Arena in New York. Michael Bisping was last seen in action at October of 2016’s UFC 204 event in Manchester where he scored a hard fought unanimous decision victory over mixed martial arts legend Dan Henderson. 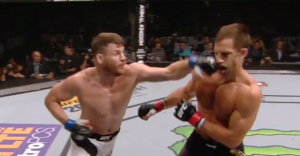 Prior to that, Bisping was coming off a first-round knockout victory over Luke Rockhold which earned “The Count” the UFC’s middleweight title. As for Georges St-Pierre, the former UFC welterweight kingpin has not fought since November of 2013 where he defeated Johny Hendricks via split-decision. “Rush” is currently riding a twelve fight win streak with includes victories over Nick Diaz, BJ Penn, Matt Serra, Matt Hughes, Thiago Alves, Jon Fitch, Jake Shields and Carlos Condit. If Georges St-Pierre can defeat Michael Bisping at UFC 217 he will become only the fourth fighter in UFC history to hold UFC titles in two different divisions. Randy Couture, BJ Penn and Conor McGregor are the only fighters in UFC history to have achieved this accomplishment. Who do you think comes out victorious when Bisping and St-Pierre square off at Madison Square Garden on November 4? Be sure to come watch the UFC 217 event live at Kalapki Joe’s, the Westernmost Sports Bar in the U.S.A! According to White, the UFC’s decision to book Bisping vs. St-Pierre came while watching round five of the UFC 214 co-main event scrap between Tyron Woodley and Demian Maia. Woodley easily defeated Maia via unanimous decision, but the fight itself was not very entertaining for the fans. With that said, the UFC opted to take away Woodley’s promised fight against “GSP”. Michael Bisping was last seen in action at October’s UFC 204 event in Manchester where he scored a hard fought unanimous decision victory over mixed martial arts legend Dan Henderson.